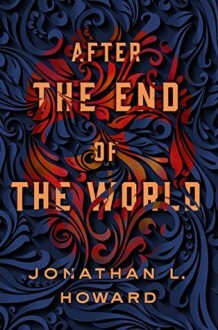 After the End of the World by Jonathan L. Howard brings the H.P. Lovecraft mythos into the twenty-first century.The Unfolded World is a bitter and unfriendly place for Daniel Carter and Emily Lovecraft. In this world, the Cold War never happened because the Soviet Union ceased to exist in 1941. In this world the Nazi Großdeutschland is the premier superpower, and is not merely tolerated but indulged because, in this world, the Holocaust happened behind the ruins of the Iron Curtain and consumed only Bolsheviks, Communists, and others the West was glad to see gone. In this world, there are monsters, and not all of them are human. But even in the Unfolded World, there are still bills to pay and jobs to do. Carter finds himself working for the German secret security service to uncover the truth behind a major scientific joint project that is going suspiciously well. The trail takes Lovecraft and him to a distant, abandoned island, and a conspiracy that threatens everything. To fight it, Lovecraft must walk a perilously narrow path between forbidden knowledge and soul-destroying insanity.Fortunately, she also has a shotgun.